The degree of development of the sharing economy is an important measure of a city’s innovation. Since in the near future where highly advanced IoT and AI technology will have improved the society’s efficiency, the sharing economy surely becomes one of social infrastructure. In this episode, we analyze the actual situation of sharing economy in Fukuoka City from various angles, and think about the possibility of further innovation creation of the city. The hosing is an example of sharing economy that already exists in our lives. We will examine how much sharing progresses in the most basic human act of “living”, based on comparison of the ownership ratio of major cities here. You can see that the ownership ratio of Fukuoka City is far lower than those of the other major cities. It seems to endorse the large number of residents moving in and out of the city. You can see that the culture of lending space in Fukuoka City has existed prominently compared to the other cities. Fukuoka’s Sharing of Automobiles Is Still on a Par with Other Local Cities. Speaking of personal mobility, cars have developed as the major item in modern times. We compare the sharing of mobility first examining the number of cars per household. 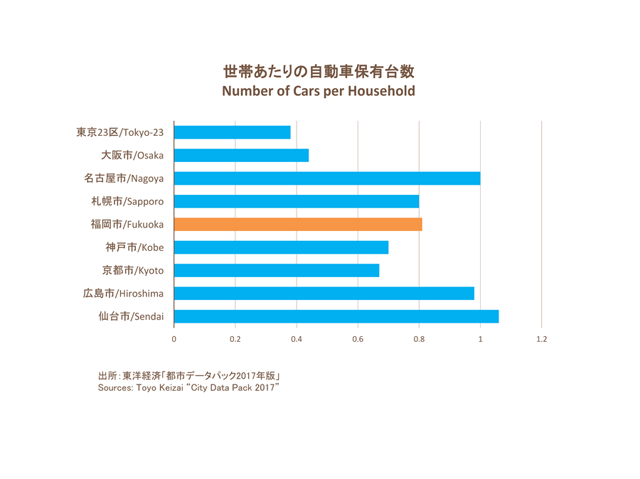 The number of cars per household in Fukuoka City is about twice the number of the lowest Tokyo metropolitan area, and it is as high as those of the other cities in rural areas. The result may be influenced by the development of public transportation and the perseverance of customs using car for commuting. Regarding mobility by car, the sharing culture of Fukuoka City seems to be still under development. Is sharing of automobiles in Fukuoka City really lagging compared to other cities? 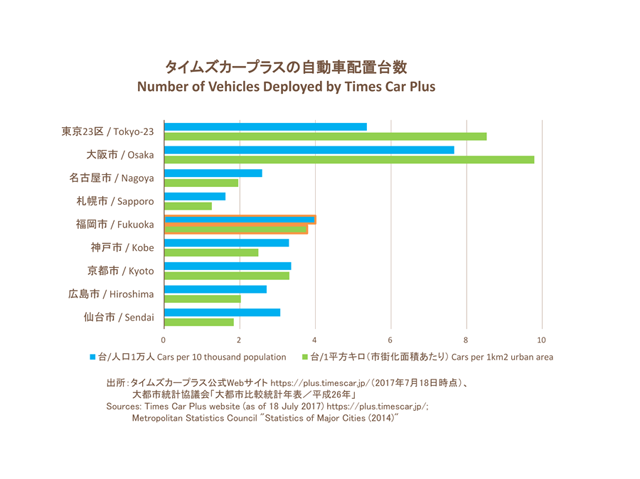 Here, we will look at the number of vehicles deployed by Times Car Plus in each city, which boasts the top share of the market nationwide in the car sharing industry. The numbers of units deployed in Fukuoka City, both per urbanization area and per population, are next to Osaka City and the 23 wards of Tokyo. The sharing culture of cars in Fukuoka City, which seemed to be low when looking only at the ratio of cars per household, has turned out to be developed. It may be because of the high proportion of young people including college students. The Japanese government has recently enacted a new law on vacation rentals. As a result, it became possible to do business in private houses, and at the same time the permission under the Inns and Hotels Act and the upper limit of the number of business days per year were institutionalized. Fukuoka City enacted an ordinance concerning vacation rentals (under certain conditions, restrictions on business days and the obligation to set up the front desk were loosened.) to support vacation rentals. But is the new culture accepted in the society? 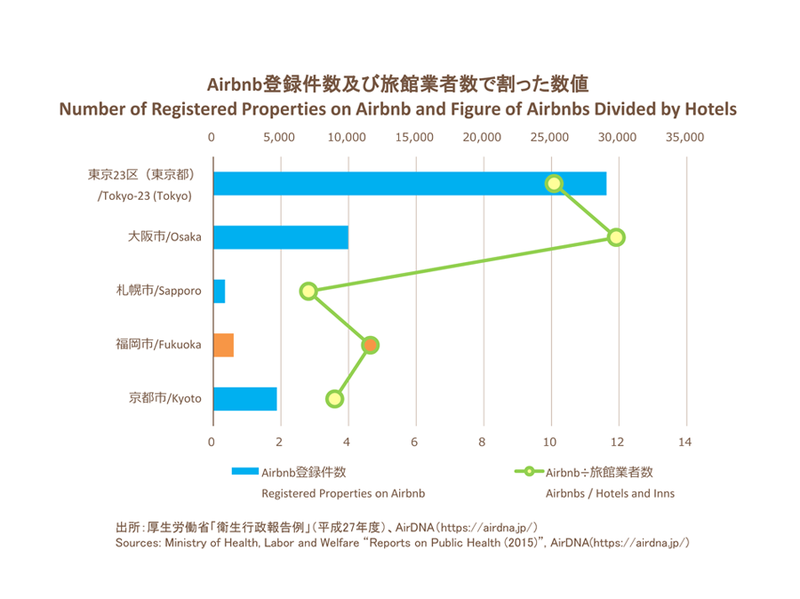 Comparing the number of Airbnb registrations in major cities, the number of registrations in Fukuoka City itself is not high. Next, we compare the number of Airbnb registrations with the number of inns and hotels of each city. It can be said that Airbnb has successfully been incorporating the market share’s vacancy caused by the capacity shortage of existing accommodation facilities. When comparing the number of Airbnb registrations per inn, one can see that Fukuoka City has a high figure next to Tokyo’s 23 wards and Osaka City. 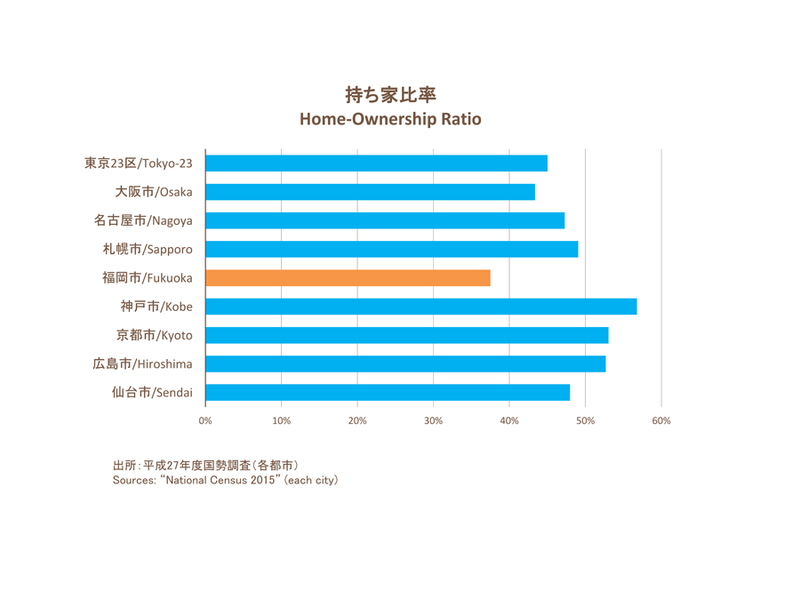 This tells us that Fukuoka City’s accommodation sharing is being commercialized at a ratio close to Tokyo and Osaka. Airbnb established the first “Home Sharing Lab” in Japan in Fukuoka City. Airbnb is clearly anticipating the growth of Fukuoka City’s potential in the industry. What to be addressed next is the sharing of bicycles, which is the most familiar means of transportation that ensures cities’ mobility. We have the data that Fukuoka City has the highest ratio of bicycle use in major cities as a means of commuting (Fukuoka Growth 2013-2014, URC, p.73). 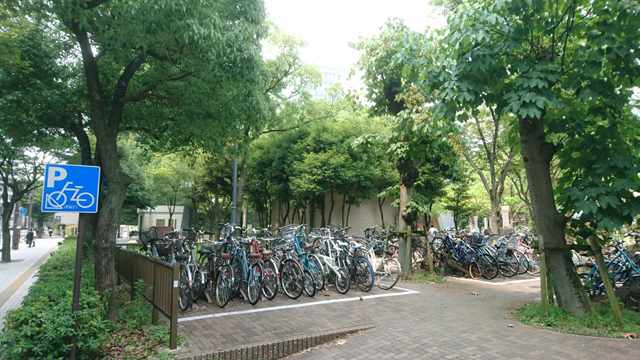 Initially, Fukuoka City was working on expansion of bicycle parking lots as a solution to illegally parked bicycles (its result in Japanese only: http://www.city.fukuoka.lg.jp/doro-gesuido/cycle/hp/parking.html). Today, in addition to further maintenance of the bicycle parking lots, the maintenance of bicycle lanes, creation of discount scheme of “Nocchari” (Japanese only) for subway and bicycle parking lots, are added promoting the bicycle-friendliness of the city. In June 2017, Mobike Co. Ltd, which started from China and has developed bicycle sharing business all over the world and has grown rapidly to become a unicorn company, made the first base in Japan in Fukuoka City. This is also an example of Fukuoka’s high acceptance of the sharing culture and high bicycle use rate compared to other cities. Mobike refers to itself as the 4th generation shared bicycle service. The previous community bicycle (3rd generation) had the limited convenience due to the port (designated station) system, and there was no advanced technology about them. 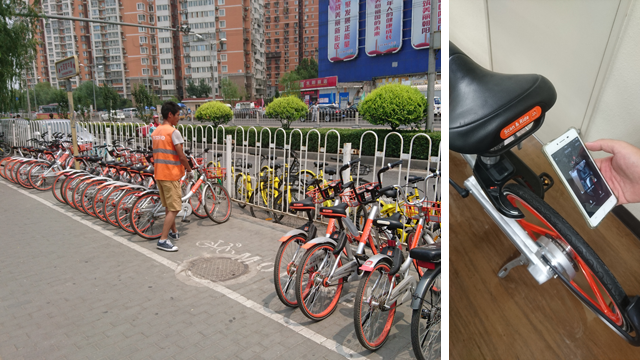 However, Mobike does not require the installation of a port (it can be dropped off where it can be parked), and is equipped with GPS and IoT telecommunication functions on the body, which enables everything from settlement to unlocking / locking and tracking all done within bicycle’s body and application. Alipay and WeChat Pay, China’s two big online payment service providers, can be used for payment, and users can use the service immediately only after easy registration on the application. Also, according to Mobike’s official white paper, in 92.9% of the cases of moving within 5 km, travels using a combination of Mobike and public transportation systems result in the less travel time than travels using cars (Beijing City). In Fukuoka, which has a reputation for being a compact city nationwide, most travels in the city fits within 5 km. In addition, Fukuoka City, where the maintenance of bicycle parking lots is progressing, is considered to be the first city to be the most suitable city for the shared bicycle business, over Tokyo and Osaka. As a result of examining the recent status about the sharing economy of Fukuoka City, we confirm that Fukuoka City shows high compatibility with the sharing economy. However, Japanese society still faces many challenges towards the spread of the sharing economy. For example, as you can see from the present situation in China, the spread of smartphones and electronic payment tied with the phones is a great prerequisite for the development of the sharing culture. In Japan, the integration of the two has not progressed, which makes innovation supported by the simultaneity of payment within the application installed difficult to happen. If Fukuoka City could tackle to solve such problems, we should be able to promote the sharing economy and therefore the city’s innovation. For example, if all the IC payment cards issued within the Fukuoka area are completely unified and a discount or premium was given to both the public and private sectors for its use, it would be possible to dramatically increase the use rate. And if they were integrated with smartphones, it could be actively used as a local payment method for the sharing businesses. In the UK, payment amount by cash became less than half of the total payment amount in the county for the first time this year. Britain is the first country outside Asia which Mobike’s service entered. Sweden has set the goal of eliminating all cash by 2030. In the world, there are fewer and fewer countries and areas where the culture of being cashless has not progressed. Along with that, the sharing economy seems to be progressing as well. It is now questioned whether Fukuoka City can successfully catch this trend.